The dropping out of the calculation of electricity/gas price rises (+6.4%) in December 2013. A decrease in the cost of food due to a combination of soft commodity price decreases during 2014 and competition amongst UK retailers in December – particularly for vegetables (-7.1%). 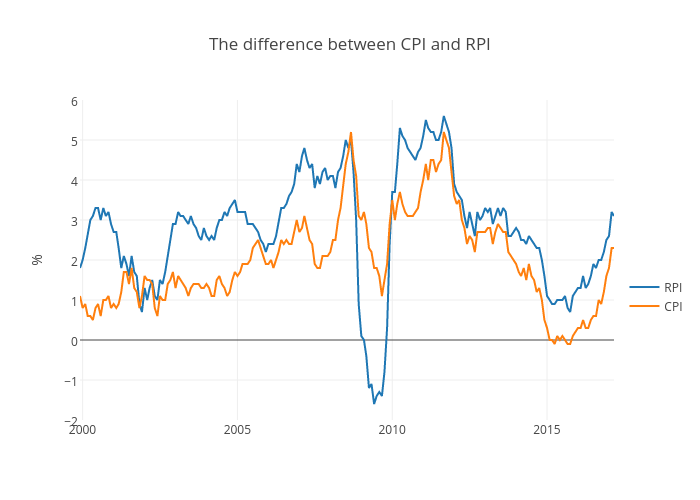 Despite this, underlying core inflation (which excludes energy and food/drink) was slightly higher at 1.3% implying that once these commodity price falls have worked through the system, CPI may well rise again. Indeed some sectors of the economy continue to witness significant rises including: education 10%, tobacco 7.7%, books/papers 5.1%, rail fares 3.9%, health insurance 3.8%, recreation/culture 3.6%, wine 3.5%, postal services 3.3%, water/sewage 3.2%, and hospital services 2.6%. It includes the effects of housing – house prices rose about 9.5% in 2014 according to ONS. See coverage issues. It uses a different method for averaging prices. See calculation issues. This particularly affects clothing costs which RPI estimated to be rising by 6.4% but CPI said it was declining by 0.4%. Full details can be found at the ONS website.